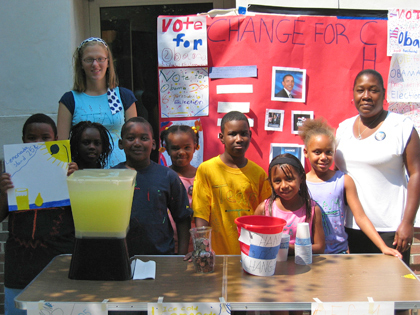 CHANGE FOR CHANGE: Third grade students in Summer Exploration gather change for change for Senator Barack Obamas campaign by managing a lemonade stand in front of the Henry Pannell Learning Center on Witherspoon Street. Ashante Thompson (far right), the third grade teacher, noted that the campers had been learning about the voting process and civic participation as part of the camp curriculum and decided to get involved in the campaign. Summer Exploration is the only locally sponsored summer camp in Princeton that includes academics, recreation, and travel, according to Dana Hughes, the Director of Programs and Resident Services for the Princeton Housing Authority and camp coordinator. The third part of the Boroughs Zoning Board hearings on the Greenview Avenue condominium case concluded late Thursday night with a 4-3 vote to deny Architect J. Robert Hilliers application to rezone the three properties in question by variance. The Princeton community will soon learn about, and be able to respond to, plans for a new pool complex. At its Thursday evening meeting, the Joint Recreation Board approved a motion to engage a consulting firm that will meet with local residents to discuss the need for new pool facilities, and to hear what pool users would  and would not  like to have in an updated facility, which would be located on the same site as the current pool. At least one of the meetings will occur poolside, according to Recreation Department Executive Director Jack Roberts, so residents can see where there are problems with the existing complex, and envision plans for the future. Rushes are round, but sedges have edges, quoted Steve Hiltner, Friends of Princeton Open Spaces (FOPOS) naturalist and member of the Princeton Environmental Commission, while showing the group assembled the deceptively-named wool grass, which is actually a sedge. Typically, rushes have round stems, whereas those of sedges are more triangular. You can differentiate between the two by rolling them between your thumb and forefinger. Some people just come for the toys, said volunteer Rosemarie Hunninghake, as she surveyed the growing stock of clothing, books, kitchenware, and yes, Barbies, accumulating in the Herrontown Road storage facility being used by the University Medical Center at Princetons Auxiliary as they prepare for their annual White Elephant and Rummage Sale. As far as Paul Teti was concerned, his international rowing career concluded with his appearance on the U.S. lightweight four which finished ninth in the 2004 Summer Olympics. Mike Teti didnt exactly jump at the opportunity to coach in the U.S. national rowing program. Amy Kolman drew on her experience as a teacher in taking the helm of the Community Park Bluefish swimming program this summer.